The trauma services of NSW provide expert care for injured patients, coordinating the multidisciplinary teams and advocating for patients, both within the acute and rehabilitative phases. A major trauma service (MTS) can provide the full spectrum of care for major and moderately injured patients, from initial resuscitation through to rehabilitation and discharge. A regional trauma service (RTS) can provide all aspects of care to patients with moderate to minor trauma, and definitive care to a limited number of major trauma patients in collaboration with the MTS. A RTS provides initial assessment, stabilisation, definitive care and initiate transfer to an MTS when a patient requires services not available at the RTS. Local hospitals are also an important component of the inclusive trauma system, but are not designated trauma services. These local hospitals may be tertiary hospitals, such as Prince of Wales Hospital, while others are hospitals serving predominantly local communities in metropolitan or rural areas. As per the Ambulance Service of NSW Protocol T1, these local hospitals will be bypassed for major trauma. However, they will continue to receive minor to moderate trauma cases via ambulance and occasionally major trauma by private transport. In rural and remote areas, where the travel times are too great (>1hr) for patients to be transported directly to a RTS, the rural local hospitals will provide initial assessment, resuscitation and early transfer to a RTS or MTS. NSW Department of Health (2009). 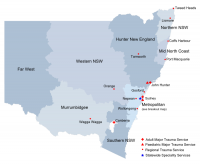 Selected Specialty and Statewide Service Plans: NSW Trauma Services. Sydney: NSW Department of Health. pp. 37.